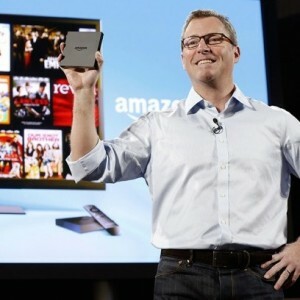 Amazon continues its quest to become more than an e-commerce powerhouse, announcing Wednesday a set-top box that allows HDTV viewers to connect to Amazon’s video offerings. Mashable The set-top device, called Amazon Fire TV, will be sold for $99. It is a small flat box with a remote control. The hardware aims to take on the Apple TV, Roku and even the Xbox One. The Internet-connected set-top box, which uses voice search when you speak into the remote and also serves as a gaming console, was announced during a launch event in New York City on Wednesday with Amazon VP Peter Larsen playing master of ceremonies, not CEO and founder Jeff Bezos. WSJ The new Fire TV is an ambitious move by Amazon to break into the living room. Amazon offers a streaming-video service to its Prime subscribers, but until now has been largely dependent on other hardware manufacturers to deliver that content to televisions. Sales of streaming media devices such as Roku are expected to grow 24 percent this year, according to market researcher Strategy Analytics. Apple currently leads the market, followed by Roku and Google, the firm said. NYT Fire TV will show a range of content from other providers, including Hulu, Netflix and ESPN. With a separate $40 controller, it can be used to play games, including a version of the extremely popular Minecraft. Among the improvements and enhancements promoted for Fire TV: a voice search function that allows users to utter a name like “George Clooney” or a genre like “horror” and see results instantly pop up, and a prediction feature that knows what you want and queues it up. THR The small black box began shipping Wednesday, Larsen told a crowd of reporters. It has a premium price point in line with Apple TV. Roku, meanwhile, costs as low as $50 and Chromecast retails for $35. Michael Strahan will join the cast of ABC’s Good Morning America. Strahan, the former New York Giants defensive end turned media star, won’t be replacing any individual. The Washington Post/ The Style Blog He’s not leaving co-host Kelly Ripa in the lurch on Live! With Kelly And Michael; this GMA gig would only be on a part-time basis. LA Times / Show Tracker ABC News executives are said to have begun talks with Strahan months ago, pleased with his performance during the times he substituted for Robin Roberts last year while she was out on sick leave, and heated up in recent weeks. Entertainment Weekly / Inside TV Strahan is expected to appear inGMA’s top hour without affecting the current roles of Roberts, George Stephanopoulos, Lara Spencer, Ginger Zee and Amy Robach, who this week replaced the exiting Josh Elliott. One insider insists the talks pre-date the current salary negotiations that resulted in a major pay boost for Roberts (who is reportedly making in the $14 million a year range) and Spencer (around $8 million). Stephanopoulos’ deal doesn’t expire until year’s end. The winners of the 73rd Annual Peabody Awards were announced on CBS This MorningWednesday. TVSpy Four local stations — WBZ in Boston, KING in Seattle, WVUE in New Orleans and WTVF in Nashville — won awards. CBS-owned WBZ was honored for its “wide-ranging, enterprising, non-sensational” coverage of the Boston Marathon bombings. The station was praised for becoming a “crucial source not just to [its] city but to a stunned nation.” Poynter / MediaWire Other winners include “Fault Lines,” from Al Jazeera America, which told the story of a garment factory fire in Bangladesh; “The Race Card Project” from NPR’s Morning Edition; and “180 Days: A Year Inside an American High School,” from PBS. Projects from NBC News, This American Life, BBC and Frontline won awards, as did Breaking Bad, House of Cards andScandal. New York Daily News Longtime NBC news reporter and anchor Tom Brokaw, 74, was given an individual Peabody Award for career achievement and in particular for the his work on long-form news reports after leaving the NBC Nightly News program in 2004.